58 years ago a tiny satellite was successfully lofted into orbit, firing the opening salvo in what would become the Space Race. Sputnik-1 became the first man-made satellite to orbit Earth, a trailblazer for thousands of spacecraft that have since ridden uphill while providing the initiator of technological advances that allowed humans to leave the confines of our planet. The plan of chief Soviet rocket scientist Sergei Korolev, the concept for Sputnik-1 was presented in 1954, a year prior to President Eisenhower’s plans for the United States to launch an artificial satellite during the International Geophysical Year (IGY). The Soviets evaluated numerous plans, prior to selecting the parameters for what would become the Sputnik-1 mission, accelerated by the drive to beat their American opponents. That competitive pressure resulted in a change of plans, from the launch of the more ambitious “Object D” satellite to the much lighter and easier to construct “Object PS”. The launch vehicle would be the R-7 Semyorka, the world’s first intercontinental ballistic missile. The R-7 was designed by Korolev and first flew in 1957 – achieving a successful flight on its fourth attempt, lofting a dummy warhead. The R-7 formed the basis for the Luna, Vostok, Voskhod, Molniya and Soyuz families of rockets. To date all Soviet and Russian manned spaceflights have been launched using rockets derived from the R-7 providing a legacy that ranges back to the first days of the Soviet space program. A modified version of the R-7 was approved after Korolev successfully lobbied for the use of the rocket to launch satellites. 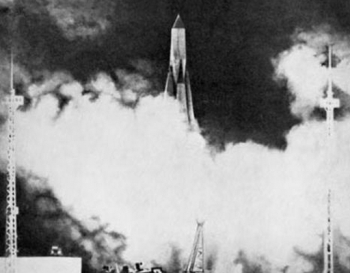 The modified R-7 rocket, named Sputnik 8K71PS, was designated to conduct the historic launch of the Sputnik-1 satellite. Designed by the chief constructor at OKB-1, Mikhail S. Khomyakov, the tiny satellite was assembled from two hemispheres – with a 1 mm-thick outer skin heat shield – which were hermetically sealed using O-rings and connected by bolts. With a mass of just 184 lb – less than 10 percent of the mass of the previously-proposed “Object D” satellite – Sputnik-1 carried two pairs of antennas, allowing the satellite to transmit beeps with equal power in all directions. For integration with the R-7 rocket, Sputnik 1 was protected by a cone-shaped payload fairing. The duo were housed at Site No.1, at what is now known as the Baikonur Cosmodrome in Kazakhstan. 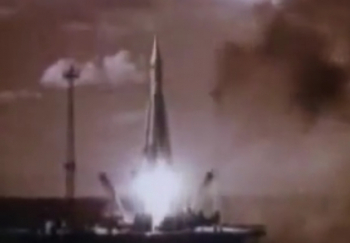 The launch took place at 19:28 UTC on October 4, 1957. Sputnik-1 was deployed into an initial orbit of 139 by 590 miles, with an apogee approximately 310 miles – lower than initially intended. However, less than 20 seconds after the R-7 shutdown, Sputnik-1 announced it had survived the intense pressures of the launch phase. The satellite’s “beep” tones were detected at the IP-1 ground station for around two minutes before Sputnik-1 fell below the horizon and out of communication. 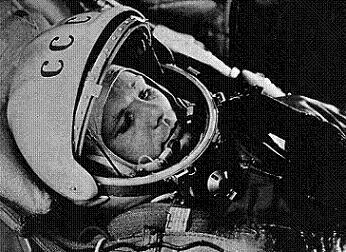 Once a full orbit had been confirmed during the next pass, Korolyov called Soviet premier Khrushchev to confirm the success. This was followed by the release to the public via the Soviet news media. 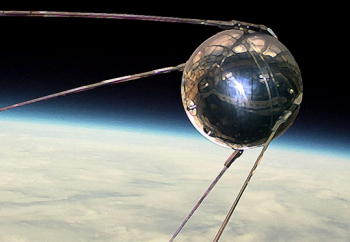 Taking 96.2 minutes to complete an orbit, Sputnik continually transmitted signals back to Earth and provided first-of-its-kind data on the density of the upper atmosphere along with information on the propagation of radio signals through the ionosphere. Sputnik continued to transmit for three weeks until its onboard chemical batteries failed, providing a huge propaganda coup for the Soviets, as Sputnik-1 taunted its American rivals with its beeping from space. With everyone from military observers to amateur radio listeners able to pick up Sputnik’s signal, the American media were not shy in advertising the success of the Soviets – in turn fueling its own passion to support its ambitions in space. In total, the spacecraft spent a full three months in space, traveling nearly 43.5 million miles (1,400 complete orbits), before burning up in the atmosphere. 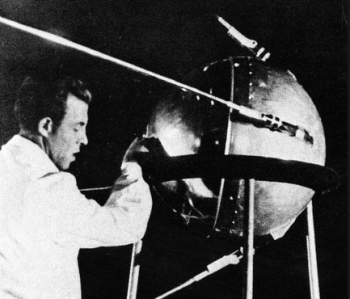 The unexpected success of Sputnik-1 ignited the space race between Cold War rivals. The desperate need for spaceflight superiority led to the establishment of the early space programs and the American success involving the launch of Explorer-1 in 1958 – the first operational US satellite. However, the Soviets would continue to set the pace, with the highly successful launch of Soviet cosmonaut Yuri Gagarin and the Vostok 1 mission in 1961. They also conducted the first spacewalk, when Alexey Leonov enjoyed an EVA during the Voskhod 2 mission in 1965. 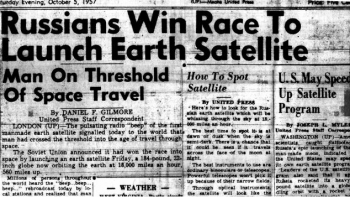 By that period, the big prize was to send humans to the surface of the Moon, which became the main focus of the space race. The United States won in the summer of 1969 via the successful Apollo 11 mission. The Russians have remained a strong space nation despite being overtaken by the United States and suffering from internal political and economic pressures. Ironically, the United States now pays Russia to launch and return its astronauts to and from the International Space Station since the retirement of the Space Shuttle – an arrangement that will continue until the latter part of this decade. Russia’s future direction and focus in space remain unclear, although Roscosmos has been citing interest in sending cosmonauts to the Moon. Meanwhile, NASA claims to be focused on launching humans to the surface of Mars by the late 2030s. (Images via NASA, Roscosmos, Historical).